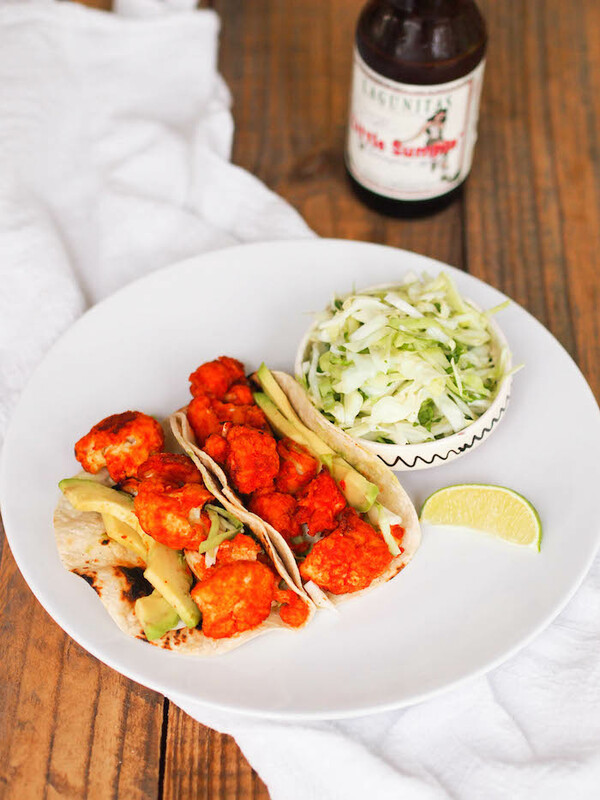 If you can't take the heat, then you probably shouldn't make these crispy sriracha-lime cauliflower tacos! Serve with a quick cilantro-lime slaw and a slice of creamy avocado to tame the spice. Oh boy, do I have an epic recipe for you today! I would call this the ultimate vegetarian man food, but I absolutely despise that term. Everything I see referred to as man food is fried, covered in cheese or a fully loaded hamburger. I mean, I'm a woman and I like fried food, you know I love everything cheese, and this may surprise you, but I also appreciate a big juicy hamburger with all the fixins'. Fried pickled green tomato, pimento cheese, bacon, and lettuce please! What annoys me is the implication that women should only like uninspired salads or, as this article hilariously pointed out, tiny portions of artificially sweetened dessert. Nope! We want substance! Okay, rant over. Now back to this recipe and the little piece of heaven that is sriracha. After fancy mustard, sriracha is my favorite condiment and I don't think I'm alone with my love for it. What other condiment has it's own hipster t-shirt, halloween costume and award winning documentary? Not mayonnaise! By the way, the sriracha documentary is one of the most adorable things I've ever watched. It was on either Netflix or Amazon Prime, and if it's still there, it's well worth watching. Between this and the Vietnamese rice noodle salad I made on Friday, I've consumed close to 1/2 cup of sriracha in 48 hours. Just building up my tolerance for our trip to Vietnam this fall! I'm proud to report back that I survived, although I did lose about 7 lbs in sweat. I'm one of those people who sweats profusely eating spicy food. I'm actually kind of nervous, because it's gotten worse as I've gotten older. My dad has the same problem and it's gotten to the point where he can't eat spicy food anymore, not because he doesn't love it, but because he'll go through 2-3 cloth napkins wiping away his sweat. It's awkward. When I think about getting older, I'm more fearful of losing my tolerance to heat than going grey or getting wrinkles! 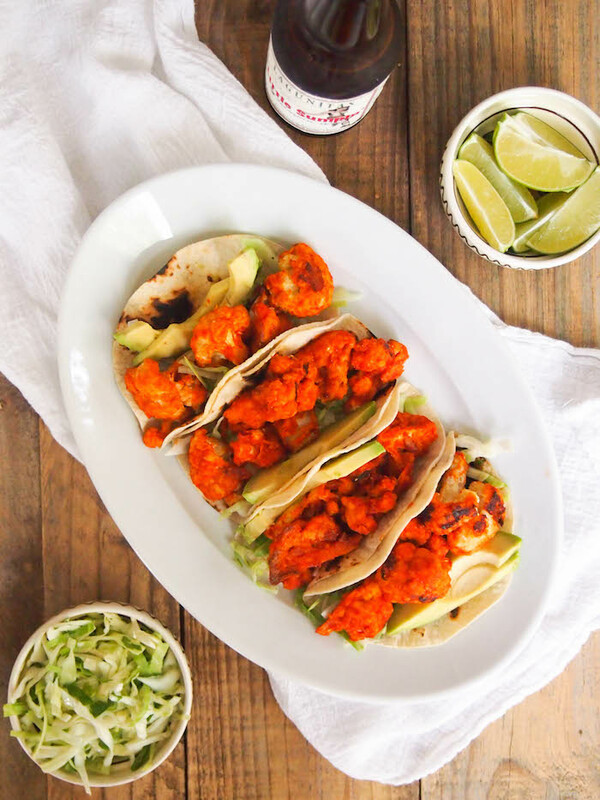 Life without sriracha, or more specifically, these crispy sriracha-lime cauliflower tacos, is a sad thought! First, make the slaw. Remove the core from the cabbage and carefully slice into thin shreds. Add lime juice, rice vinegar, cilantro and green onion. Season with 1/4 teaspoon sea salt and toss to combine. Set aside while you prepare the remaining ingredients. Then, prepare the cauliflower. Preheat the oven to 400 degrees and spray a large baking sheet with oil. Beat the egg and water together in a large bowl. Place the flour in another large bowl and season with salt. Dip the cauliflower into the egg mixture, then toss with the flour. Using a dry hand or slotted spoon, remove the cauliflower and spread evenly across the baking sheet. Spray lightly with oil and place in the oven. Bake 20 minutes, flipping halfway, until cauliflower is golden and crispy. While cauliflower is baking, make the sriracha sauce. Whisk sriracha, rice vinegary, soy sauce and garlic together in a small pot on medium heat. Bring to a simmer, then turn off heat. When cauliflower is cooked, remove from oven and place in a large bowl. Pour the sriracha sauce over the top and toss to combine. Spread cauliflower evenly over the baking sheet and place back in the oven 5 minutes to crisp. Meanwhile, toast the tortillas over a gas flame on medium-low until lightly charred, about 1 minute. Top tortillas with slaw, avocado slice, and sriracha caulifower. Squeeze lime juice over the top then serve.